This article is about the Breguet aircraft of 1910-1913. For the unrelated aircraft of the same designation flown in World War I, see Breguet Bre.4 and Breguet Bre.5. The Breguet Types III, IV, and V were a family of early biplanes built by Louis Breguet in France from 1910-1912. They built on the basic pattern established in the design of the Type II, unorthodox biplanes with conical fuselages (that earned them the nickname "coffee pots" in France and "tin whistles" in England), cruciform tails, and tricycle undercarriage, but were somewhat larger and sturdier. A Type IV achieved fame in August 1910 as being the first aircraft to lift six people. This family also included the first machines that Breguet was able to sell to the French military, after arranging a series of demonstrations for the Army. 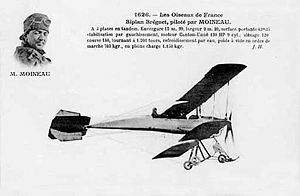 In 1911, a Type III named Breguet du Maroc became the first heavier-than-air aircraft to fly in the French colonies, with Henri Br�gi making a flight from Casablanca to Fes. Powered by the Gnome et Rhx�ne engine. Type G2-bis Powered by the Gnome et Rhx�ne engine. Major production version powered by the Gnome et Rhx�ne 75 kW (100 hp) engine, 41 sold to various military operators in 1912. Definitive military version of 1913, powered by the Gnome et Rhx�ne engine. Powered by the Canton-Unn� engine, sometimes called C-U1. Powered by the Canton-Unn� engine, sometimes called C-U2. Seaplane version of the Type U2. Powered by the Canton-Unn� engine, sometimes called C-U3. Seaplane version of the Type U3. French Air Force operated 32 aircraft of Type G3, plus some Type A-G4s. Italian Air Force operated 3 aircraft of Type G3, plus some Type A-G4s. Swedish Air Force operated 1 aircraft of Type G3. Royal Flying Corps operated 5 aircraft of Type G3, plus some Type A-G4s. Royal Naval Air Service operated 15 A-G4 aircraft. Breguet Type III Breguet du Maroc Mus�e des Arts et M�tiers in Paris. Breguet Type III Type U1 Flygvapenmusum in Malmen. Taylor, Michael J. H. (1989). Jane's Encyclopedia of Aviation. London: Studio Editions. pp. 196, 197. World Aircraft Information Files. London: Bright Star Publishing. pp. File 890 Sheet 78. Hartmann, G�rard. Les premiers appareils Breguet. Breguet Type III Pictures and Breguet Type III for Sale.